And finally, our very spunky little runt! Although she was the last to be born, the smallest baby, and is the shortest of her siblings, Ellie has enough personality to make up for all of that! How old are you? How old are you, Ellie? Do you remember? "Three"
What makes you happy? Coloring! What are you really good at? Mommy says that I'm great at finding spills of any type and wiping them up with my lovey bunny. Mommy also appreciates that I throw away the dirty diapers and put the dirty clothes in the laundry basket. I'm also great at helping pick up our toys! What do you and your mom do together? We wash our hands, brush our hair, and I like to stare Mommy down while she is going potty. I don't know why Mommy tries to go potty by herself. I think it's fun to help her! What do you and your dad do together? We dance and sing to music videos. I also make Daddy kiss and hug my bunnies every time he leaves for work. What is your favorite book? I love to read everything I can put my hands on: kid books, adult books, magazines, flyers, grocery sale ads, etc... Then Doodle and Abby come over and rip them up. What do you want to be when you grow up? Mommy says that with my personality, I'm going to do big things...like be a motivational speaker. 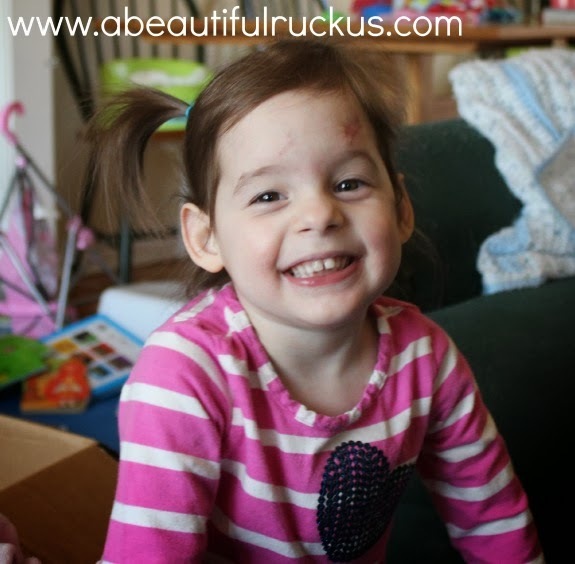 If you want to jump back, you can read Ellie's 2nd Birthday Interview here. 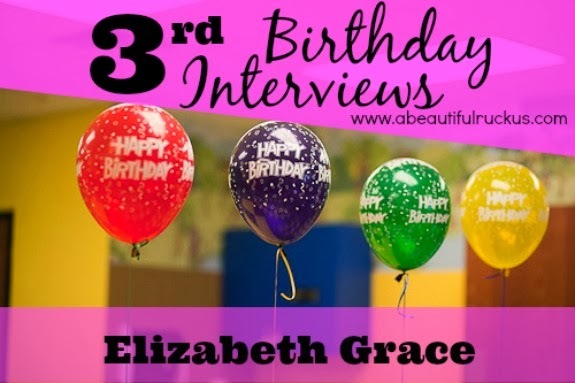 And don't forget to read Caleb, Abby, and Elijah's 3rd birthday interviews too! Hope she had a very good birthday--she sounds like a very good helper. It's cute how daddy hugs her bunnies too! I love these interviews! Thanks for sharing them.